On July 14-16, 2017, the Serbian Orthodox Church celebrated the glorification of newly canonized St. Mardarije of Libertyville. Learn about his life in an interview with Serbian Bishop Irenej of the Eastern American Diocese. 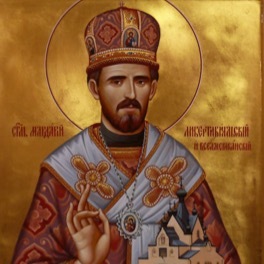 Then listen to the homily given at the Hierarchical Divine Liturgy by Metropolitan Amfilohije of Montenegro (Church of Serbia) where you will learn more about the life and dedication of this saint. Metropolitan Amfilohije of Montenegro gives a homily on the life of newly canonized St. Mardarije at the Glorification Divine Liturgy July 16, 2017. The services were held at St. Sava and New Gracanica Monasteries in Libertyville, IL. The translator is His Grace Bishop Irenej of the Eastern American Diocese of the Serbian Orthodox Church. His Grace Bishop Irenej and John Maddex discuss the life and history of newly canonized St. Mardarije of Libertyville.